Although I have no memory for critical things (everything I learnt in year 12 chemistry, important birthdays, which days my kids have sport at school), I do have great capacity for recalling random details – such as all the books I’ve ever owned. I was recently reminded of a particular childhood book when I saw the latest from author and illustrator, Axel Scheffler. 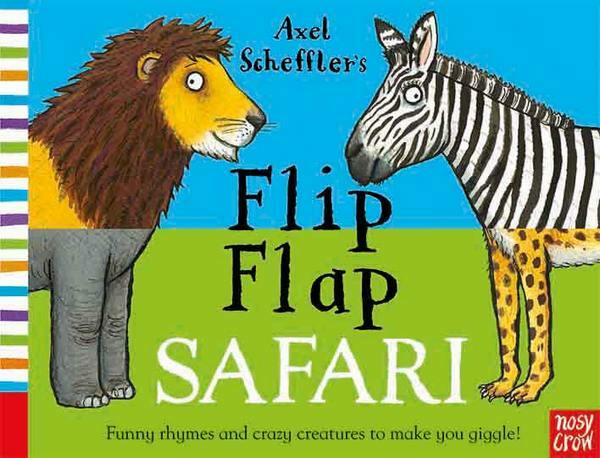 Axel Scheffler, illustrator of modern classics such The Gruffalo and Room on the Broom, has recently released a book full of crazy animal mix-ups, Flip Flap Safari. Flip Flap Safari introduces eleven wild animals, including an elephant, a giraffe, a flamingo and a lion, accompanied by a short poem. Each page is split in half horizontally, allowing kids to mix-and-match the animals and create some really wild combinations. What do you get if you cross an elephant with a lion? Why, that would be a elephon! And a water buffalo with a flamingo? Well, that would be a buffingo, obviously! The clever formatting shows the mixed-up animal name and a poem (that rhymes despite the mix-ups) that reveals the characteristics of the new animal creation. Split pages are a great way of creating lots and lots of stories out of a short book and Flip Flap Safari lets you make 121 different creatures by varying the picture combinations. The book is spiral bound with a sturdy cover, so should hold up to as much book-love as your pre-schooler can dish out. Of course, Scheffler’s distinct style is evident on each page, with bright, clear drawings and friendly looking animals (even the scary lion). Flip Flap Safari is suitable for children aged three years and over. Find it at Book Depository, where you’ll get free delivery to Australia. Flip Flap Safari is also available as an app and includes some weird animal sound effects, music fit for a safari and the mix-and-match poems read aloud. The app is $1.29 from the iTunes store.